Comments: BRAND NEW W/FAST SHIPPING! This item is: Chemical Principles for Organic Chemistry, 1st Ed., by Robert Boikess; FORMAT: Bound Book; ISBN: 9781285457697. Choose Expedited for fastest shipping! Our 98%+ rating proves our commitment! We cannot ship to PO Boxes/APO Addresses or outside the continental U.S. To avoid ordering the wrong item, please check your item's ISBN number! Comments: ALTERNATE EDITION: ***THIS IS A CUSTOM EDITION TEXTBOOK! THE SAME CONTENT JUST CHEAPER! *** Book in 'Good' Condition and will show signs of use, and may contain writing, underlining, &/or highlighting within. 2nd Day Shipping Offered! All books ship same or next business day. Used books may not contain supplements such as access codes, CD's, etc. We have the best customer service online!This is the U.S. student edition as pictured unless otherwise stated. 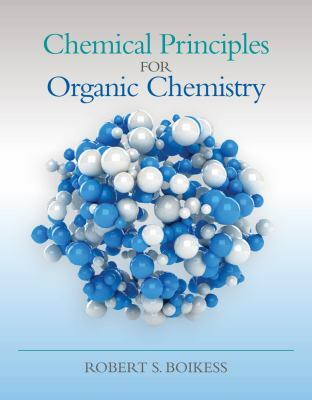 Robert Boikess is the author of 'Chemical Principles for Organic Chemistry', published 2014 under ISBN 9781285457697 and ISBN 1285457692.